A $20 Off Coupon Is Now Available on Swagbucks.com to Purchase The Complete First Aid Kit, Says Phoenix-Lazerus, Inc. The Complete First Aid kit, the best selling first aid kit on Amazon.com, is now eligible for a $20 coupon on Swagbucks.com, says Phoenix-Lazerus, Inc.
A $20 off coupon is now available on Swagbucks.com to purchase The Complete First Aid kit. There are over five million teeth knocked out each year in the United States. Teeth can be knocked out anytime and anyplace. By having a Complete First Aid kit on-hand, over 90% of these teeth can be successfully reimplanted and saved for life. Swagbucks.com is an online portal dedicated to helping you earn digital dollars called "Swag Bucks", which can be redeemed for thousands of “Real World” Rewards, including gift cards, electronics, jewelry and music. “I just had a case this week in which a 13 year girl had three teeth knocked out while she was playing in a softball game,” says Dr. Paul Krasner, Diplomate of the American Board of Endodontics. Fortunately, the school nurse had a Save-A-Tooth® in the school’s first aid supplies and placed the three teeth in the Save-A-Tooth® within 30 minutes. She was taken to the local hospital where the Oral Surgeon on staff replanted them.” The use of the Save-A-Tooth® system within 60 minutes increases the success of these reimplanted teeth to over 90%. If a Save-A-Tooth® had not been used, the success of the reimplanted teeth would have been 10%. The Complete First Aid kit, which is now eligible to be obtained for a $20 discount coupon on Swagbucks.com. 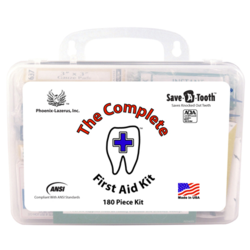 is the only first aid kit that contains a Save-A-Tooth®. People can earn Swag Bucks by participating in surveys, voting in daily polls, watching videos and sending in prize videos and photos among many other activities. The accumulated Swag Bucks can be used to buy many items at discounted prices. Using Swag Bucks makes saving children's knocked out teeth even easier and less expensive. The replacement of just one unsuccessfully reimplanted knocked out tooth costs at least $3,000-$4,000 initially and $30,000 over a lifetime. If four teeth are knocked out, it will cost $120,000. All knocked out teeth can be reimplanted and saved if they are treated immediately and in the right way within the first sixty minutes following the accident. “Being prepared for this accident is the key to success and saving the high costs of replacing knocked out teeth,” says Dr. Henry Rankow, Professor of Dentistry at Temple University, School of Dentistry. “The best way to be prepared is to have the new medical emergency device, the Save-A-Tooth® System at the time of the accident since knocked out teeth will die within the first hour,” he continues. 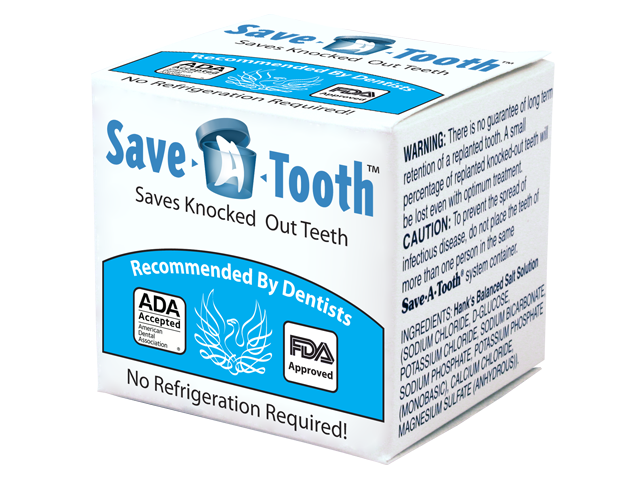 As recommended by most leading health institutions, all well-stocked first aid kits should have a Save-A-Tooth® system. “If a family, school or business facility is looking for the best first aid kit available, then the Complete First Aid kit is what they should buy,” says Dr. Paul Krasner, Professor of Dentistry at Temple University, School of Dentistry. When asked why the Complete First Aid kit has risen so high in the ranking, Dr. Henry Rankow, Professor of Dentistry at Temple University, School of Dentistry and diplomate of the American Board of Endodontics responds, “people realize what a great value the kit is. Many people do not realize that knocked out teeth can be saved. When they find out that if they have a Complete First Aid kit, over 90% of knocked out teeth can be saved. A family can save even more money buying the Complete First aid kit by using accumulating Swag Bucks. Dr. Rankow recommends that every home, car, school and ambulance should have a Complete First Aid kit available to help save the over five million teeth that are knocked out each year.